Trying to open PDF files can often freeze web browser (and computer) at times. We have already seen workaround to prevent web browser crash while trying to open PDF files. We can also prevent such issue by disabling opening of PDF files in web browser and make them open in software program for PDF files like Adobe Acrobat or Foxit Reader. 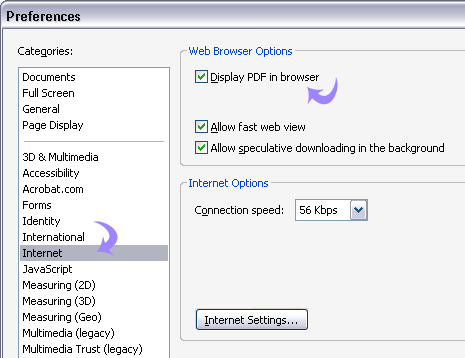 Following procedure should help disable opening of PDF files in web browser. 1. Goto Start > Program > Adobe Acrobat to open program. 2. Goto Edit > Preference (or press Ctrl + K) to open Preference window. 3. Click on the “Internet” tab on the left side. 4. Uncheck (no tick) “Display PDF in browser”. If you are using Foxit Reader instead of Adobe Acrobat: then open Foxit Reader, goto Tools > Preferences, under “Internet” category uncheck option “Display PDF in browser” and you are all set. And what I need to set, when I want to save pdf instead of opening it in adobe reader? What to configure – windows7, IE8 or Adobe 9.2 ?